A really active year is 2015. 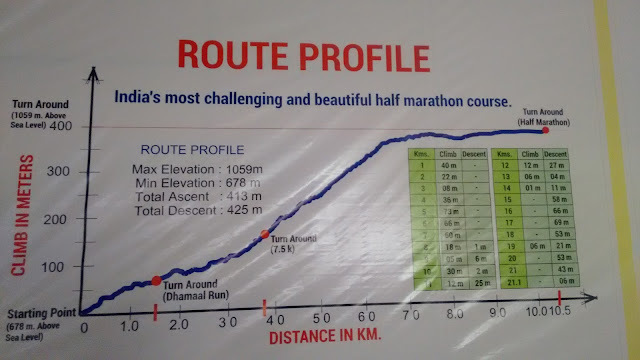 I aspire to take my running to next level and it is turning out to be exactly what I wanted. 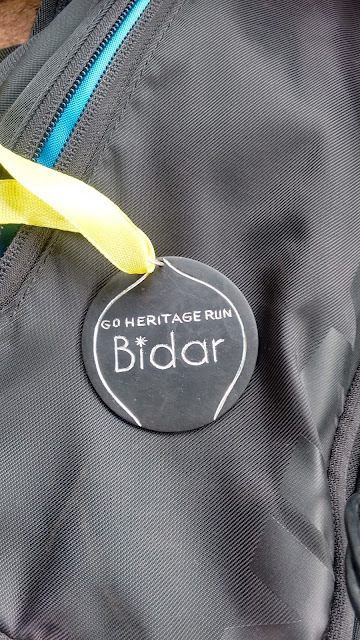 Bidar's half Marathon was part of my schedule as I target a full maraton in Jan. Since I did a 26Km run a week before, 21 was not enough of a challenge. Thankfully my dear friend Siva came up with an idea to do a bicycle ride till Bidar which is about 125Km from Hyderabad. It fitted really well to my schedule so I said yes to it. 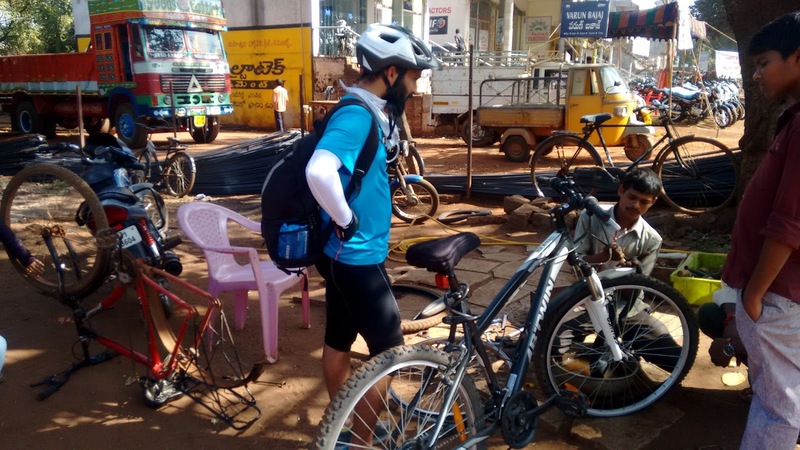 Though Siva's plan was to ride back as well, my plan was to ride till Bidar, do a 21km run next day and return boarding a bus. The day was coming closer and Abhay also confirmed for the ride. I had few skeptics with my MTB so I asked a friend for his hybrid bike. I surely had an advantage but I was quite serious about the run next day. We started on an early Saturday morning at about 5.45 am. The plan was to keep it light and risk free, riding at about 15-18kmph, to make to destination in comfortable 6-7hrs. We had a pretty fast start but. After about an hour when we stopped for tea, we were already done 25Km. We were now out of the city so the ride was more enjoyable, but more risky as well as it was a single road. I kept a rule stuck in my mind. If a heavy vehicle shave close to me I go off the road and stop. Essentially saying 'you first sir'. I was going pretty calm along with Siva, but Abhay seemed to take the lead on his MTB. Siva went ahead to slow him down and was now leading. I still remember the scary scene when Siva and Abhay were trying to overtake a bus and there was a truck honking behind them. Finally we found a spot for breakfast. Some really oily pooris and some good tea. We refilled our water bags and continued. Soon we were in Zaheerabad where sadly Abhay's bike got punctured. Luckily we were in city so we got it fixed really quick. Meanwhile Siva was on his dream ride. He did wait for us but only after completing his century under 4hrs (03:58 precisely). Just about 25kms left for Bidar when we took the turn after Zaheerabad. Now was the most leisure ride we did since morning. We kept stopping at random points (like at Karnataka state border or the small section under the trees). This road was surrounded by forest or natural shrubs all through and with much lesser traffic we took good 2 hrs to complete this almost flat section. We were now in Bidar. We met few runners who had also arrived here for the run. They suggested us the Bidar gurudwara will be ideal for stay. I heard about this place, the Nanak Jhera gurudwara, sometime earlier but never got a chance to visit. 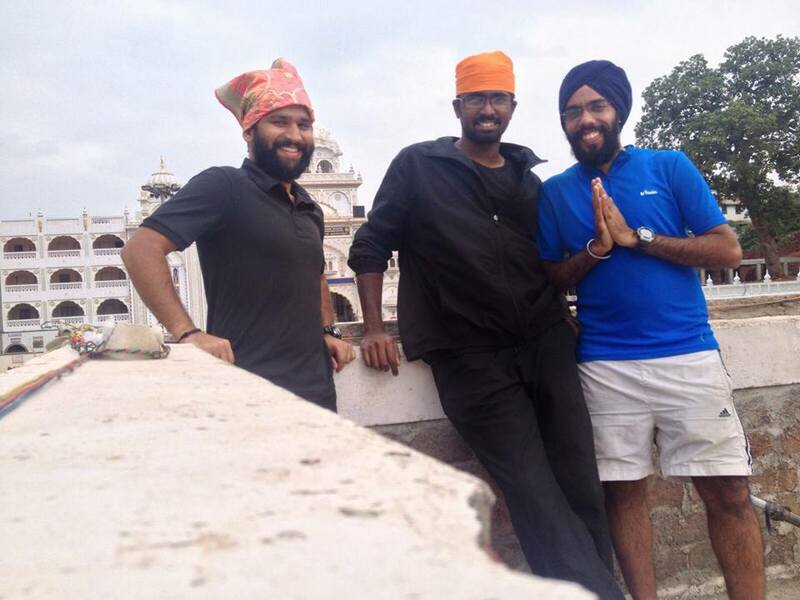 Another 5 Km of navigating through the streets of Bidar we finally reached this huge premise of the Gurudwara. We got a room as well at just a 100 per head cost. Surprisingly the rooms were really big (and very clean), all our bikes easily fit in them and still plenty of space. After a shower we made our visit to the actual temple and the langar hall for our lunch which was simple yet really delicious (as always), followed by an equally good tea. We met some really polite nihangs (armed sikh men) who guided us. Too tired we all wanted to sleep for a while before heading to the Bidar fort where I was supposed to collect my running Bib. Evening was a nice ride to the fort which was just 3Km from the Gurudwara. I collected my bib for the run and the t-shirt (no timing chip as its a fun run). 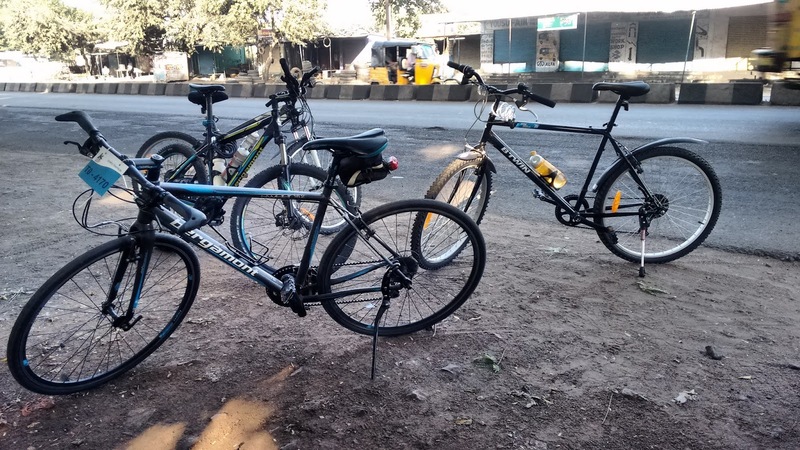 We sat for some snacks at the fort canteen but I was irritated by the people around who were curiously hovering around our bikes that we parked. It was fine till the point they starting playing around with the gear and one also tried to ride. We had to intervene to stop them. It was dark now. 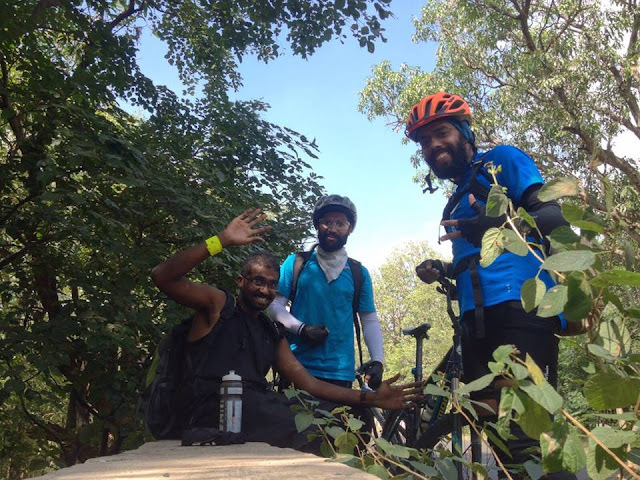 Siva's idea was to ride around the city for sight seeing and add few Kms as he wanted to make it 300 by tomorrow evening. We agreed and started our random exploration. It was fun and then finally we settled at a place for dinner. Back to the room without much delay I fell on my bed but catching a sleep was tough. I could hardly manage 3-4hrs of sleep. I had my bananas for carbs and lot of water. I was ready to leave for my run expecting my roomies to wake up as well as they had to ride back to Hyderabad, but they seemed dead so I left them. I got a ride till the start line from a fellow runner Nivedita. It was a fine atmosphere with slight cold morning and some 200 odd runners (one of them just 5 yr old, Nivedita's daughter). 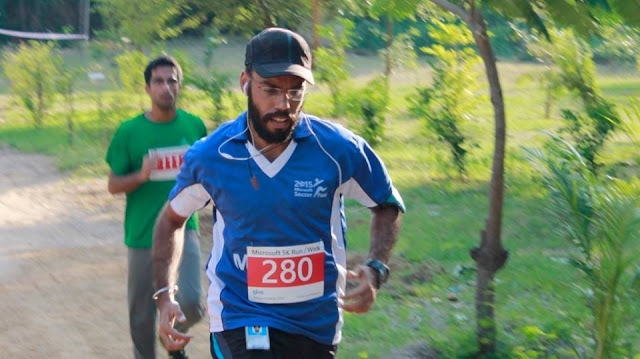 Sunil Menon, one of the only 13 Iron men in India, was also here. I had a chat with him as he's a fellow Microsoft employee. He gave a good warm-up session to all the runners though I refrained mostly to save my energy for the Run. The run was flagged of by the police commissioner who was charming and a very fit man, unlike the commissioners I saw earlier. He was himself participating in the half marathon which was also surprising. The run started at around 7am, covering the fort periphery and then taking us downhill to city's outskirt. At 4km, at first water station, I did my stretching as I was warmed up now. We had to climb back to Bidar city through a steep section near gurudwara. After that we ran through the tombs inside Bidar memorial park. We were running throughout the city visiting many such monuments, darwaze and the clock tower. That's the idea of a UNESCO heritage run to sight see a heritage city while you run. After about 10Km of running around the city the road took a steep downhill and I was out of the city again. This was the best part of my run and I was quite alone here. Infact I asked few people if they saw few other runners going that said which they confirmed. In a lonely landscape an infinite long road I could see with no human on it. I was running, talking to myself and listening to the bird calls. Finally I saw a water station that confirmed I was on right path. I realized we were heading to these tombs outside the city, don't remember the name. I saw a few runners returning on the same route. I reached these tombs which were beautiful. I checked my Strava and it said 13Km done. So another 8km to go and the route now lead through a small village, very green as we ran under the tree shade for about a Km. I was tired now and could see one other lonely runner in front of me. We were both slowly running. I did not stop till the water point from where we were routed to a totally barren section of a newly cut road. The Sun was at it's full now. On this barren section I overtook the only runner I had alongside. Now I was jogging on this never ending section, not a person in sight on this deserted mud road. I again felt maybe I lost my way but I kept jogging for about 15-20min to finally see a pointer that pointed to left. I was exhausted and half a km later I saw few volunteers with water bottles in hand cheering for me. I sipped water and took a break here as now was the most difficult part of the race, a steep climb ahead till the fort. 500mtr more they said but my strava read 17.5 so I did not believe them. I held my breath and started to climb. It was hard, really hard. I was not able to gain any pace whatsoever. After about 10min I decided to walk. There were some local vendors leaning and pushing their bicycles uphill with some sacks hung on them. I joined them and continued my walk. It was now time for the final push. I ran again, against the climb. It was harder than ever, even harder than Satara I would say, coz this was under the sun. It was about 9.15am and after a narrow section, the final steep climb, I was the entrance of the fort. It all started here. Few minutes later I was at the finish lines. Among the cheers of few I finished with a smile on my face. I got an amazing medal, made by a local art of etching on metal called Bidari. I had my breakfast and then did sight seeing with fellow runners. I met an interesting women from INTACH who was comparing the artistic design of the fort with those of what she saw in Iran. She was able to correlate how the art traveled from middle east to this part. Totally tired, I went back to the gurudwara. Siva and Abhay had left long back and were already very near to Hyderabad. After a bath and langar it was now the complicated part, to arrange a ride back to hyderabad for me and my cycle. Thankfully I wasn't alone, we were 6 riders in the situation. After long 3 hrs wait and research by our tired souls, we finally got a tempo arranged. It was a slow day as we left Bidar at 3PM and reached by around 7PM. I met my fellow friends and we had a dinner together. It was quite a happening weekend for me.